With all the natural occurrences of the number five, it is little wonder that it is included in art, literature, and mythology, nowhere is this more evident than in the rites and rituals of the Freemasons. Music, Art, Literature. 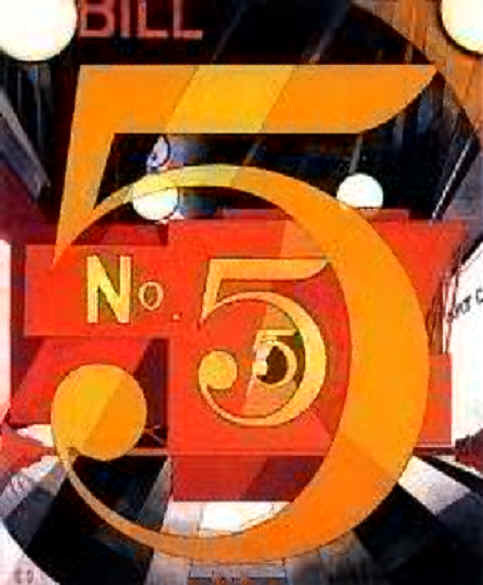 The painting on below, I Saw the Figure 5 in Gold, is by Charles Demuth, an American painter who was a contemporary of Georgia O’Keefe. It was created in response to the William Carlos Williams poem The Great Figure. To have a lodge, there must be five members: “the worshipful master, the two wardens, and two fellows of the working class.” These five are required to hold a lodge “in allusion to the five noble orders of architecture, namely the Tuscan, Doric, Ionic, Corinthian and Composite,” these are also sometimes referred to as the classical orders. In addition to the rituals of the freemasons, the number five is an integrat part of the heritage and rituals of the Eastern Star.